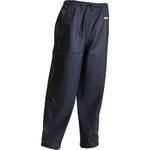 Leading Suppliers of Work Trousers and Shorts. Work trousers and work shorts come down to personal style. We have over 200 work trousers to choose from (yes, seriously!). These are all in stock, same day despatch. 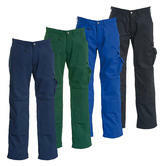 We stock work pants from leading brands, including Blackrock work trousers which are stain resistant, Teflon-coated; Cargo work trousers are work trousers with external pockets on the legs, just like the Caterpillar cargo pants, white Tranemo Craftsman trousers; Of course, the Dickies Redhawk trousers are always popular: Dickies RedHawk work pants with knee pad pockets, or Dickies Redhawk WD884 lightweight work trousers with knee pads. 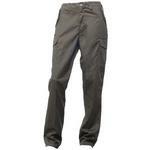 What about Snickers work trousers?, such as these Snickers work trousers. 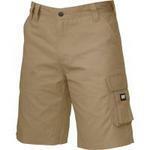 We also stock work shorts, including Blackrock Hebden shorts and Caterpillar work shorts. ALWAYS use knee pads: knees don’t last forever – so give them all the help/protection they need. Knee pads also protect your knees from hits and knocks when you are walking around. (not just when you are kneeling). We recommend internal foam knee pads – which are a standard size and slot into the knee pad pockets in any worktrousers with knee pad pockets that we supply. Alternatively, you can buy external wraparound knee pads. If you are on your knees a lot, why not try the Helly Hansen Ashford cargo pants, which have Cordura Knee pad pockets – for more durability. 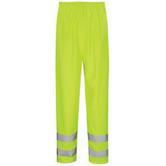 For hi viz work trousers, look no further than the Leo Bideford hi vis trousers. Most hi viz trousers are also waterproof. 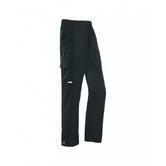 The more expensive ones are windproof, waterproof, breathable – such as the Sioen Bangkok waterproof trousers. 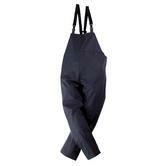 Did you know we supply FR work trousers? Anti-flame trousers (or Flame Retardant worktrousers – it’s the same thing) by Lyngsoe, Portwest, Sioen and Wenaas. They’ll protect you when you are exposed to fire, sparks or splashes of molten metal. 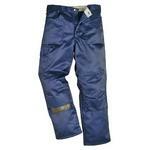 PS We can tab and logo any work trousers, in-house - just let us know where and what logo you want. Looking for more work wear to match your worktrousers? 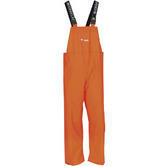 - check out our full North Sea Workwear range.